How strong is God? Really. Just to warn my regular readers (both of you) that I’m going to have a little rant today. So you may want to skip this post! At the moment in the UK we have the Leveson Inquiry into the culture, practices and ethics of the press. This has sprung up from the whole phone hacking scandal and is attempting to solve the problems inherent in the press. I have followed a lot of it on the BBC as it, oddly, is quite good entertainment. However, I rarely read a newspaper these days so I have no idea if they’ve improved. I’m tempted to say they haven’t after yesterday morning I noticed the headline of one of the tabloids. 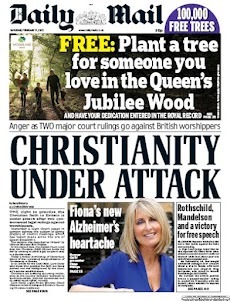 The Daily Mail headline, splashed across the front of the paper, was Christianity Under Attack. This has to be one of the worst headlines in quite a while. Apart from making the regular Mail readers froth at the mouth, it is completely false. The story it refers to is this: Councillor, Clive Bone of Bideford Council, objected to prayers being a part of the agenda of council meetings. He is an atheist and objects to prayer being an official part of council proceedings. He won a court case to have them dropped as an agenda item at council meetings. That’s it. This, apparently, spells the end of Christianity being the dominant religion in this country. I heard someone on the radio the other day saying that this is a Christian country and saying prayers is part of that. I agree, the completely pointless practice of offering thanks or requests up into the sky, is the mainstay of most religions, Christianity being one of them. However, I’m not sure that prayers are an essential part of the political landscape. I had no idea that prayers were said before every council thing. Does that mean that the allocation of my council taxes are being determined by God’s response to these prayers? Or housing issues? Or the fortnightly recycling collection? Given I believe that prayer does nothing (except make the praying person feel better about passing on any responsibility for their own actions to a non-existent higher power) I would like to vote for the exclusion of prayer from council agendas as well. Perhaps the time could be used a little more profitably. Most people would think this whole thing was just a waste of time and a very pointless exercise designed to hold up the true meaning of council business but there are people who believe that prayer should have nothing whatsoever to do with how a council carries out its duties. On the other hand, the pro-prayer group believe that, because this is a Christian country, then prayers are mandatory. I have a slight problem with this. The UK was, perhaps, once a Christian country but in these days of multiculturalism (don’t get me started on this which, like prayer, is actually non existent), all religions are tolerated and, you could argue that in a free country, people should be able to believe whatever twaddle appeals to them. Because there is as much diversity in this country as there are objects of devotion, it should be the case that all religious practices should be given the opportunity to indulge themselves as an agenda item at council business. So, whether you are a Christian, a Jew, a Druid, a Moslem, a Jedi, a muppet…it doesn’t matter. All creeds get a go. Well, not all of them all of the time. I’m not insane! Of course there’d only be an agenda item for each relevant belief structure. After all, it’s a bit mad to have someone dance around the room with a tambourine singing ‘Hare Krishna, Hare Hare...’ when there’s no Hare Krishna’s in the room at the time. It actually makes me quite angry that people who are supposedly looking after the country’s best interests can spend time getting embroiled over something so pointless. They don’t even get the facts straight. A lot has been said about stopping people praying, about banning prayer. This is patently rubbish. You can pray whenever you want to but not as part of a non-secular council meeting. In fact, Harry Greenway, a former Tory MP and ex-chairman of the National Prayer Breakfast, said: ‘If people do not want to attend prayers of this nature, they can stay away instead of meddling and busybodying with other people’s beliefs.‘ But that’s not the case. If they are supposed to be present for the whole meeting they can’t stay away! Clearly Harry didn’t read the entire thing before reacting in that typical Daily Mail way. Jesus, Harry, the complaint was about the prayers being part of the meeting. Stupid man. Harry’s not the only politician involved in such a heretical act. Eric Pickles has also waded in with this: ‘The ruling is surprising and disappointing. Christianity plays an important part in the culture, heritage and fabric of our nation.’ He is, apparently, going to try and reverse the ruling. Why? Apart from anything else, it’s a complete waste of our money. Mr Pickles is the Communities Secretary. I always thought this meant all the communities and how they hold together. I think he’s showing a bit of a bias there. I guess our community is supposed to be Christian. But, back to the headline…this is plain and simple incitement. It’s designed to make Christian England angry; to get them to gnash their teeth and growl at the destruction of everything they hold near and dear. They’d never bite if the headline read: ‘Councils to stop wasting time.’ That just doesn’t do it when you can give them all barrels with a nice little slice of incitement. It must have been very tempting to somehow tie in the Moslems. Maybe they are in an indirect way. The headline does almost imply a crusade. The Daily Mail continually makes me angry. And I don’t read it. I’d NEVER read it because I know it would still make me angry but for all the wrong reasons. Maybe they have a place in our liberalist country. I seriously hope not. I don’t think it’s right to inflict one’s own opinions on someone who has no ability to form their own. Education rather than indoctrination, I say. As I thought about all these things, while walking back from the shops, it occurred to me to wonder why God needs all these prayers anyway. Surely he/she/it/they know everything that’s going on. Isn’t that what omnipotent means? Though I quite like the idea that all the assorted gods are sitting around a big mahogany conference style desk with the best leather executive chairs, deciding who’s prayers to listen to. Peace in the Middle East? 21 virgins? Lotto numbers? Reincarnation as a cockroach? I’d go minute secretary at those meetings. Honestly, it doesn’t say a lot for the ‘Almighty’ if he/she/it/they needs to be constantly praised before council meetings can start. Is he/she/it/they even interested in council proceedings? Like me, I have to assume that he/she/it/they would just doze off after the prayers had started. This entry was posted in Gary's Posts and tagged council, Daily Mail, God, prayer, religion. Bookmark the permalink. 2 Responses to How strong is God? Really.